My idea was to take a few large foam-boards, which I bought for $6.30 at the local Hobby shop, cut them in half, and bend them into a parabola. While they were bent, I taped aluminum foil tape to one side. This helped hold the shape but I need to test the shape and adjust, so I then punched a hole on each end and used a small nut, cork and wire...to hold the shape and adjust it as needed. When I found the light line, I copied the shape with two others. This is a very simple idea. No math, just a simple dial-in approach. I then took the boards outside and with wooden pegs, connected them so that I could swivel them and find the vertical focal points to couple with the already established horizontal focal points. I put a wooden planter with a wine glass of water as my target. As I was focusing, the sunlight went into the glass and exited downward onto the wooden planter in a focal point that burned the wood within seconds. Obviously, the idea is working well. Now it's just a matter of adding "reflective canoes" into the gaps and taping it up. I think the adjustable-bow is an excellent idea which is why I posted this story and the pictures. Hopefully this helps others get ideas. This is great, an excellent and innovative means of making a parabolic with the most basic of materials. Yes, this is exactly why we invite all to share their own solar cooking experiences so that all may benefit from it. We'll be interested in seeing more as you finish it up. 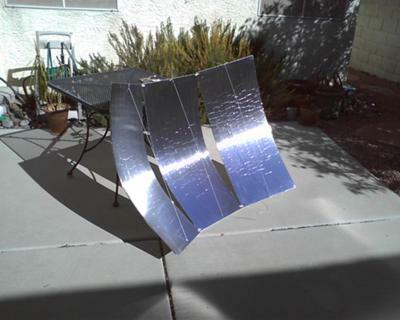 Every now and then I'll visit the Wiki Solar cooking design page and look for ideas. which is like my Solar Bow, but obviously better. The story of this Lesotho baker using the cooker for a home-based business, is inspiring and has given me some ideas. 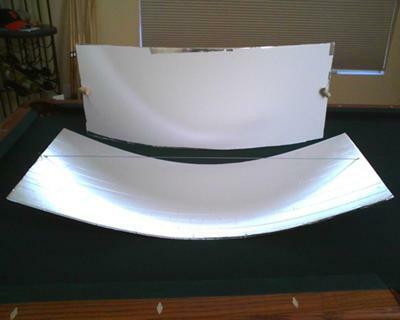 Has anyone seen someone take a parabolic dish for cooking, or parabolic trough like the one I demonstrated here, and use it to focus sunlight onto a solar panel? Why couldn't there be a lightweight parabolic or trough, that uses a simple sun-tracking program to rotate a lightweight solar cell in concentrated sunlight, throughout the day. When you're not cooking food, you attach a small solar panel to capture the concentrated solar being put out by the device. The Scheffler design focuses sunlight throughout the day, onto a heat exchanger for cooking. Why not use it for concentrated PV? Just banging around ideas here. If I wind up with some extra cash, I'll experiment with it on my own, but it would be nice not to reinvent the wheel, if someone else has seen something out there. for inspiration on how to take the parabolic-trough to some kind of completion. Fascinating stuff.